Should You Monitor or Block Internet Activity at the Office? Monitoring online activity at work is still a controversial subject. Many are concerned that putting such a system in place may potentially infringe upon employee’s rights and may cause hidden consequences in the workplace. Are these concerns founded? While there is some truth to the concerns, by and large employers have every right to secure the internet in the office, but just because you can, does this mean you should? It depends. The decision should stem from many factors, including your employees. However the most important factor you should take into consideration is the culture you are trying to perpetuate in the office. How internet monitoring is deployed can make or break the culture, and can send strong messages to your staff. If done correctly, employees understand that it’s a way to ensure office productivity. If done incorrectly, it can send the message that you don’t trust your employees, and can cause paranoia in the office. So should you monitor internet activity at the office? Well, that also depends. Here’s a list of pros and cons to help you determine if internet monitoring and website blocking is right for your business. The obvious pro to monitoring internet activity is to increase office productivity by reducing non-work related internet activity. Internet monitoring often gives you the ability to also block certain sites, which may help your company reduce malware and viruses on office computers. Monitoring and blocking internet activity can also help reduce the risk of sexual harassment and types of other charges, by reducing the ability to access explicit and inappropriate websites. Sometimes when internet blocks are too broad, it may actually impact your employees ability to get their work done, particularly when a site the actually need for work is blocked. Depending on how the monitoring and blocking is done, you could signal to your employees that you don’t trust them, which could impact office moral. Suppose an employee is dealing with abuse issues at home, and they use the company internet to research their options. Your IT guy notices this, and for whatever reason decides to discuss it with yet another employee in the break room. Now the first employee’s secret is out, about a sensitive issue they may not be ready to discuss with anyone, let alone the office. While this example is extreme, it does happen. Instead of blocking the internet entirely at the office, try these solutions as a better way to monitor the internet. Your employees will thank you for it. Don’t just implement the internet policy without telling anyone, and certainly don’t bury the policy deep within your employee manual. Instead, take the time to inform the entire office of the change, and the reasons for implementing the policy. Then, have new employees read, and sign, the internet policy rules separately from the employee manual, to help them fully understand what they can and can’t go on the internet at the office. If possible, try blocking sites only, instead of also logging keystrokes. 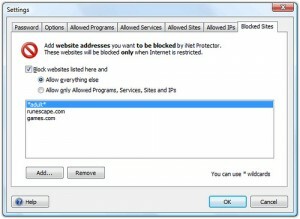 This helps you reduce the obvious offending sites – pornographic sites, Facebook, etc. – without blocking all access to the internet, and without obtaining information such as usernames and passwords, which get logged with keystroke software. Instead of blocking the internet all the time, give employees certain periods of the day – say lunch time – where they can surf the web unhindered. This shows that you understand the importance of them needing to balance their work and personal life, without letting it get out of hand in the workplace. Similarly, you could also create an internet café in the break room, with computers that have open internet access. Businesses often give employees access to snack and soda machines, and give smokers smoke breaks, so why not let your employees take an internet break? These are just some ways you can help take the pain out of monitoring internet activity in the office. Has your office implemented internet monitoring or website blocking? What did you do to reduce employee concerns? Julie Strier is a freelance writer who likes to help make your office culture a little bit better. Email: julie@mybusinesswriter.com. Website:www.mybusinesswriter.com.